How much does a yard of concrete cost? I get asked "how much does concrete cost?" a lot, I guess that's just part of being in the concrete business. I have been pouring concrete floors and doing decorative concrete for the last 30 years. I have to order concrete everyday from different concrete company's for all the jobs we do. I think it's important if you are a homeowner, builder, or contractor to know the cost of a yard of concrete and what the extras are that will be added to the price per cubic yard. Below, I will list a current concrete company's price list, that I use, of 4 different PSI strengths of concrete. I live and work in central Maine, so these prices will reflect the cost of concrete in my area. 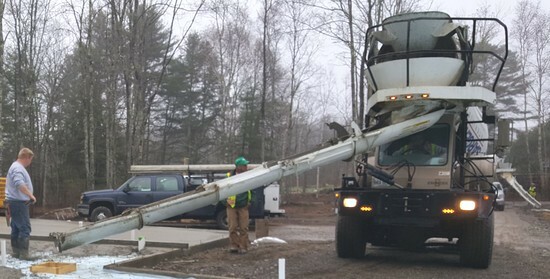 They should give you a good idea of what concrete cost, but always check your local ready mix concrete cost with a company in your area for exact pricing. In addition to the concrete cost per yard, I will also list the "extra's" or concrete additive cost - enhancements that you can add to the concrete. These concrete additives are optional but important to know. What does concrete cost per yard? Here are 4 popular concrete mix designs used by most concrete contractors. For higher PSI Concrete mixes you should contact the concrete company you are using directly. What do concrete additives cost? Concrete Additives that add to the cost per cubic yard of concrete. What are some other charges that add to the cost of the concrete? Some other fees you may get charged from the concrete company. You get 7 minutes to unload each yard, after that they charge you per hour. If you only order 3 yards, they charge you an extra $80.00 dollars for being under 5 cubic yards. This charge will vary between company's, make sure you ask. In cold climates, they have to charge extra to heat the concrete with hot water. Make sure you ask, they could also charge by the hour. Sometimes there may be a fuel surcharge if the cost of fuel reaches a certain price, ask in advance. Do concrete companies offer any discounts? It's usually faster to unload the concrete, gets them their truck back quicker. This concrete company has a 100/250 RULE. If you have a SINGLE PLACEMENT of 100 cubic yards of concrete or any SINGLE PROJECT requires in excess of 250 cubic yards of concrete, they will give you a discount per cubic yard. Hopefully these concrete prices help answer your question "How much does concrete cost?"